When I walked through the Church History Museum prior to the renovation I came away most impressed with Jeffery R. Pugh‘s Early Spring, 1820. I love the composition, the technique, and especially the colors. I know the Church favors the realistic interpretations of Harry Anderson or Tom Lovell, but I like a more subtle or abstract approach to these historical events. Follow Jeff Pugh on Instagram. 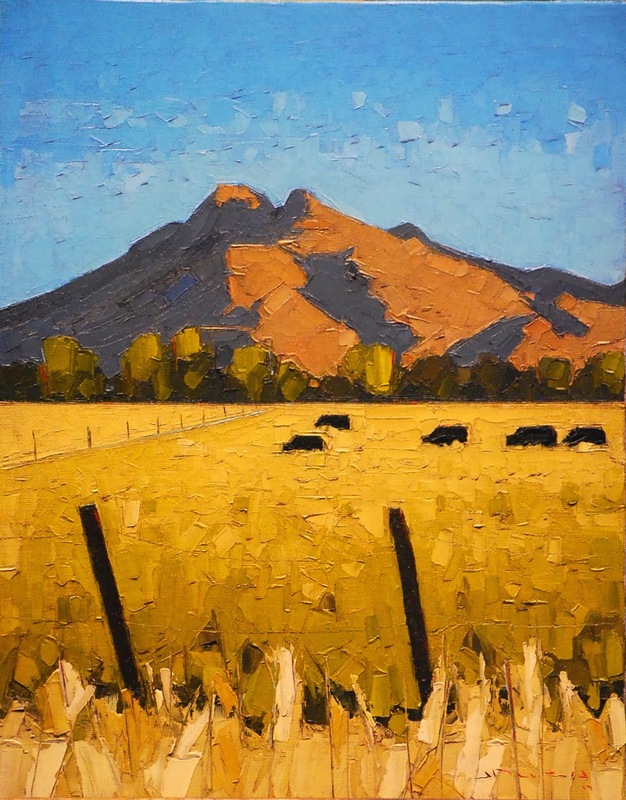 Jeffery R. Pugh paints a distinct style with heavy use of a palette knife to create beautiful Utah landscapes. 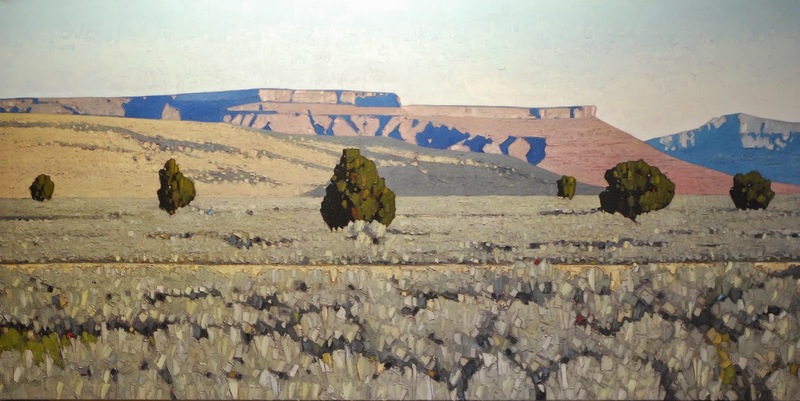 Pugh uses color to great effect and transforms what I feel are bleak, barren Utah landscapes into unique, pixelated images. He reluctantly admits to being known as ‘The Cow Guy’ as a number of his agricultural scenes include one or more bovine–often looking right at the viewer. 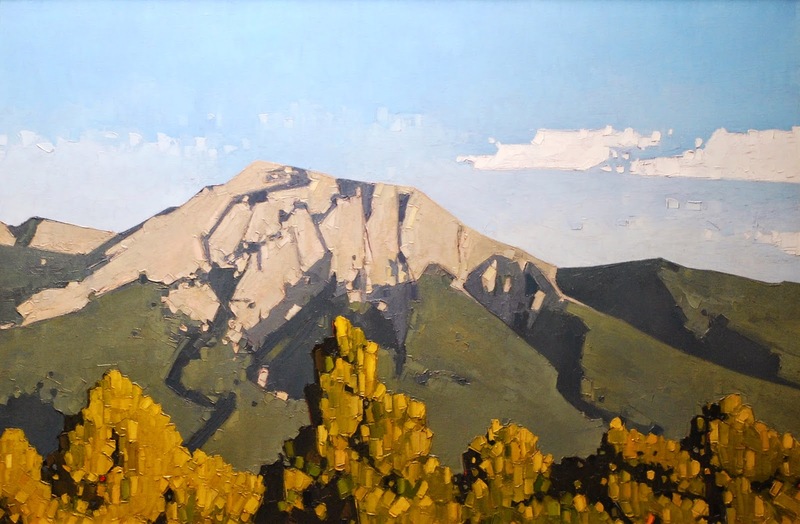 Pugh’s paintings are collected nationally and he exhibits at a number of western galleries. 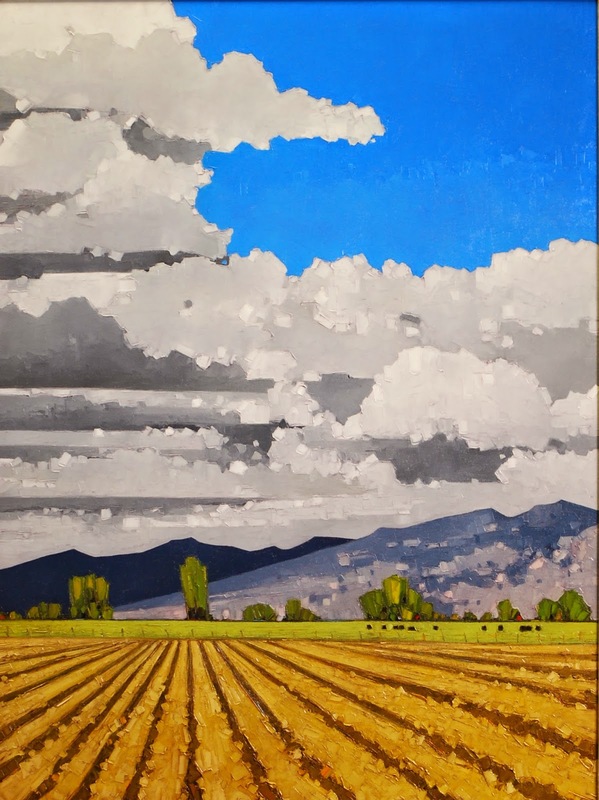 He graduated from the University of Utah in 2004 with a degree in Painting and Drawing and currently lives in Salt Lake City, Utah with his wife and two children. 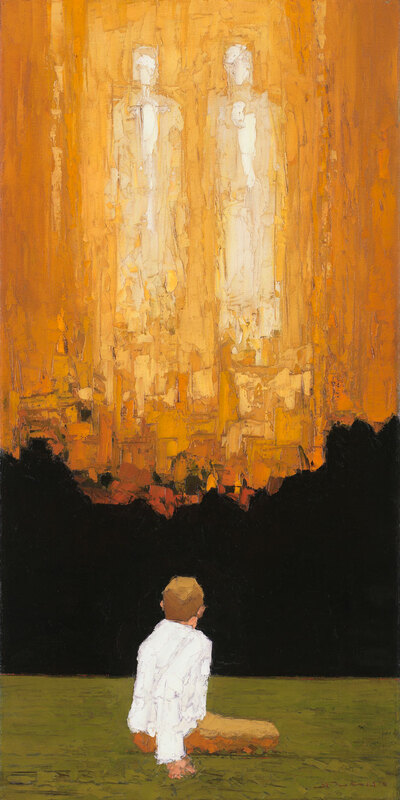 At what point did you realize you were going to be able to make a living with your painting? I’m still hoping to be able to make a living! The truth is, about two years into painting full-time, I remember feeling some confidence that it would work out. I had quit my job right as the markets crashed in 2008 and it was nothing short of a miracle that we survived. It took a couple of years but I remember having this impression that if I put in the work, everything would work out and it has so far. Who do you consider your mentors in your artistic evolution? The obvious first mentor for me would be my father-in-law – Gary Ernest Smith. He has been so supportive of my career and has helped me avoid some of the pitfalls that young artists can easily fall into and opening other doors for me. I love the work and concepts behind Maynard Dixon, Van Gogh, and Degas. Each was pushing beyond the traditional whether it was composition, content, or design and I am trying to do the same thing. You have a great reputation now for your landscapes, but do you worry about being typecast? I think any artist that is recognized for a single subject worries that they won’t be able to push the boundaries and be recognized for something different. For that reason I have made sure that I am painting something a bit different each week. Whether or not that gets into the market is a different story but I have to be willing to express who I am otherwise I’m not much better than a factory that spits out work. Recently I have been able to release some figurative things into the world and I’m thrilled that they have been accepted just as well as my landscapes. It has meant that I’ve been able to continue to explore this facet of my work with more confidence. Art is often a solitary profession. What do you do to keep in touch with the art community and other artists? I’m horrible at keeping in contact with other artists – don’t get me wrong, I love all of my art buddies and I usually resort to stalking them on Facebook and Instagram to stay up with what they are doing but between my studio time and family life, I barely have enough time to sleep. I try to keep up with the upcoming shows and try to go to as many openings as I am able but I certainly miss more than I attend. In the end I guess that it is a good thing that I don’t mind long hours with just canvas, paints and some music.